Donald Trump’s presidency comes with greater than normal risks. But his policy announcements should improve in quality over time and pragmatic pro-growth policies are likely to ultimately dominate populist policies. However, the Trump honeymoon with investors is likely over with a short term period of correction/volatility likely to continue in shares, bond yields and the $US. But despite this, we see shares trending higher over the next 6-12 months. Since the US election last November US and global shares rallied around 8% and Australian shares rallied around 12% to their recent highs. Related to this the US dollar, bond yields and some commodity prices also pushed significantly higher. Optimism regarding Donald Trump’s pro-growth policies were not the only factors playing a role in this rally – global economic indicators have improved significantly in most regions – but they certainly played a role. With Trump now inaugurated as President we are at the point where that optimism is being tested. Donald Trump has only been President for two weeks but it seems that he has already done a lot with numerous major announcements. So far the key moves relate to: minimising the economic burden of Obamacare; reviewing new regulations; preventing non-government organisations that perform abortions from receiving Federal funding; withdrawing the US from the Trans Pacific Partnership free trade deal; freezing Federal hiring; moving towards approving the Dakota and Keystone XL oil pipelines; speeding up approvals for high priority infrastructure projects; reducing regulatory burdens facing manufacturers; directing the construction of a wall with Mexico; support for a “border adjustment tax”; and various restrictions around immigration – in particular a 90 day ban on travellers to the US from seven majority Islamic countries. While these moves are basically consistent with his campaign policies, some have created considerable consternation in the US and globally. And Trump and his teams’ “thin skin” has led to various distractions – eg, around how many people attended his inauguration and “alternative facts”. Initially investment markets reacted favourably after Trump’s inauguration as many of his orders were pro-business, but the travel ban has seen uncertainty creep in around whether the new administration knows what it is doing (the ban seems to have been poorly thought through in terms of implementation and legalities as it was not vetted by the bureaucracy first) and around how isolationist Trump is prepared to take the US. Quite clearly Trump is a different kind of US President to the norm. This note looks at the main issues of importance to investors. He could make a major policy mistake - for example, some of his recent announcements don't appear to have been well thought through (eg, the travel ban). He could trigger a major global trade war which could adversely affect global growth. Or, in targeting countries with which the US runs a trade deficit and its NATO allies for not “paying their fair share”, he could threaten the flow of cheap funding that the US benefits from. He could go the way of Nixon (impeachment, resignation) who was known for his thin skin and paranoia regarding the media - Trump seems to be making an enemy of much of the media who are no doubt likely to try and do their best to discredit him eg, around conflicts with his business interests, the Russian link or whatever. His proposed fiscal stimulus risks a further budget and public debt blow out. When Ronald Reagan took over US public debt was 30% of GDP, now it’s over 100% and the budget deficit is likely to deteriorate in the years ahead thanks to the aging population. Or it could overstimulate the US economy causing a far more aggressive Fed. Alternatively, Congressional constraints could mean that any fiscal stimulus is underwhelming and/or that he fails to relax the Dodd-Frank financial regulations. Achieving tax and spending changes will be easier for Trump as the Republicans have simple majorities in both houses of Congress which is all that’s required, but measures outside of the budget require 60 out of 100 Senate votes which will necessitate support from some Democrats. His jawboning of US companies to keep production in the US could backfire leading to low US productivity. The track record of governments trying to direct companies is not great. But this will only become apparent over the long term and if production does remain in the US it will increasingly be dominated by robots anyway. These risks are real but shouldn’t be exaggerated. In assessing Trump there are several key things investors need to allow for. First, all new administrations make mistakes initially reflecting inexperience and the bureaucracy not yet in sync with the President. And with Trump and his team less experienced than most and the bureaucracy perhaps even less on side than normal, the mistakes are likely to be greater than normal. But as the process improves with the bureaucracy moving into line with the Trump administration, policy announcements should look smoother and more considered. Second, he is not a traditional Republican president. Some of his policies are classic Republican – lower taxes, deregulation – but some borrow from the left – infrastructure spending or even old fashioned protectionism. Despite some comparisons to Ronald Reagan he lacks Reagan’s consistent ideology. He will follow his own course. Third, his support base is middle America. Supporting them with jobs and higher wages is critical. Getting stuck in a trade war with China and Mexico that just pushes prices up at Walmart by 20% won’t go down well with his support base. Fourth, he has a loud and more direct approach to communication – what some call a huge mega phone. And he has no constraint in using it against politicians or companies who get in his way. Related to this his open mouth approach is prone to reversal – think about his comments about locking Hilary Clinton up, border adjustment tax (initially “too complicated” but now working on it) and torture (initially supporting it and then leaving it to his Defence Secretary). We have to get used to a lot more noise coming out of Washington, but the key is that much of it will be just that: “noise”. Fifth, he is a businessman who prides himself on his negotiating skills. So for example the imposition of a tariff on imports from China or Mexico may just be the opening gambit in a negotiation designed to extract a better trade deal for the US rather than necessarily being the final outcome. Finally, his time to get his legislative agenda through Congress is limited. The President’s party normally loses control of it in the mid-term elections (as Obama did after his first two years) – so he doesn’t want to waste too much time. Given all this I remain of the view that despite the rough start the pragmatic growth focussed Trump will ultimately dominate the populist Trump. But we have to allow that it will take a while for pro-growth policies to be legislated – eg, the President and Congress may not agree a tax reduction package until later this year – and that fears of trade war are likely to get worse before they get better as Trump embarks on a tough negotiating stance. This should ultimately be supportive of US/global growth but there will be volatility (and noise) along the way. After their large gains from around the US election, share markets, the US dollar and bond yields all entered 2017 with a degree of vulnerability. Shares, for example, had become technically overbought, and short term measures of investor sentiment had risen to levels of optimism that are often associated with a correction. 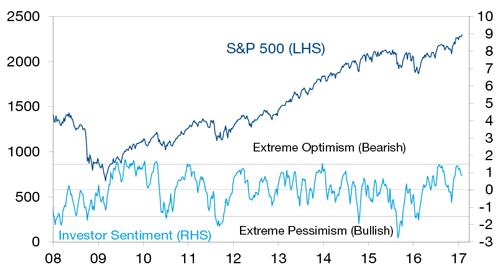 See the next chart for US shares which tracks a measure of short term investor sentiment based on surveys of investor optimism and demand for option protection against the US share market. Since Trump’s election played a part in the rally, it was always likely that a period of uncertainty about what Trump would do - whether we get the pragmatist or the populist - could drive this, and this seems to be the case. 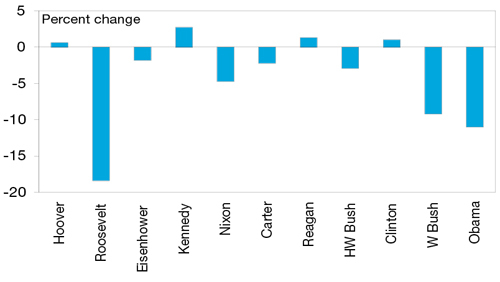 This in fact is not out of line with the historical experience where US shares in the first February of new presidents have had an average decline of 4% since Hoover in 1929. Of course other factors played a role: with the Great Depression for Roosevelt; the start of the tech wreck for G W Bush; and the tail end of the GFC for Obama exaggerating the declines they saw. But the pattern of an initial period of uncertainty, often around communication mistakes, is apparent. However, despite the likelihood of a bout of short term market turbulence we see share markets trending higher over the next 6-12 months helped by okay valuations, continuing easy global monetary conditions, some acceleration in global growth, rising profits in both the US and Australia as Trump’s pro-growth policies start to impact. Debate about a “border adjustment tax” in the US is heating up, but what is it? Basically many countries including Australia and Europe have a consumption tax – which only taxes goods and services consumed in the country. So imports are taxed and exports aren’t. The US has state based sales taxes but these are not the same as a consumption tax. In part to address the imbalance and at the same time lower America’s corporate tax rate from a globally high 35%, House Republicans have been working to move the US corporate tax system to only tax activity relating to goods and services consumed in the US. This would entail taxing imports and rebating tax on exports, ie, undertaking a “border adjustment”, just like when tourists show up at the airport when leaving Europe for a tax refund on goods they have bought there. Such an approach would make it harder for companies to lower their taxable income (via transfer pricing), redress the imbalance where the US does not have a consumption tax but other countries do, and because America imports more than it exports it would enable a lower corporate tax rate with talk of a 20% rate. Trump initially rejected the idea as being “too complicated” but appears to have come round to it lately. However, it’s not clear Republican senators would support it and there is a long way to go. But if it does get up it would be a huge boost for US exporters (eg, Boeing) and a huge negative for importers (eg, Walmart) and would put significant upwards pressure on the $US which could then nullify the border adjustment. Of course it may also be subject to a World Trade Organisation challenge (although the US may argue most other countries do the same with their consumption taxes) and it would put significant pressure on other countries to move to the same system. At the very least a 20% US corporate tax rate would only add to the pressure on Australia to lower its corporate tax rate.